To encourage flue gases to rise, we install a flexible steel sleeve through the existing chimney system, connecting it directly to the rigid pipe coming off the stove. Once this has all been fitted, we backfill with vermiculite insulation. When a stove is initially lit, the air vents are open to establish a hot blazing fire. Once this has been achieved, the stove user will turn the appliance down to enjoy the radiant heat from a controlled burn. Meanwhile the steel lining system has been brought up to optimum working temperature and the insulation around it helps to maintain the flue temperature during the long slumber burns, which are characteristic with stove use. There are a great many manufacturers of flexible lining systems, of which we have used several. There are differing grades of steel and different locking mechanisms to help keep the product together as it is bound as two separate strips of steel. Inferior twin lock flue can lead to springiness in the product, which tends to concertina when it is inserted through an existing flue. This can prove very awkward when trying to install, especially if bends and offsets are present within the flue. Often twisting can help to install a flexible lining, but weaker locking systems all too often separate under stress and need to be scrapped, as it is not permitted to join two lengths of flexible lining within a chimney. Cheaper flue often means weaker material, and ultimately false economy. We are regularly called to remove failed flue systems after only a handful of years. Faulty installation practices, inferior grades of steel or the use of incorrect fuel being the main causes. As stockists in Northern Ireland, 904 grade Docherty Chimney Group flue is primarily the flue we use at County Down Stoves and Flues. It carries a 20-year warranty, and is suitable for use with wood, turf and coal appliances including smokeless coal. If only wood and turf are going to be used, we will use Docherty’s 316 if asked and it carries a 10-year warranty. 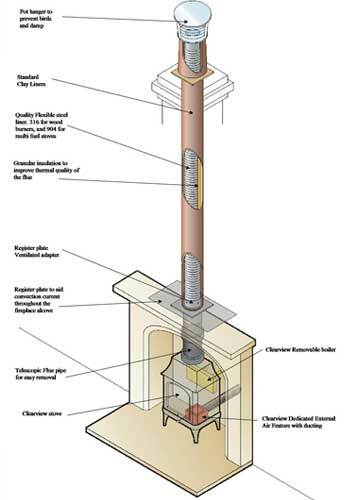 Docherty flue is more robust, with increased rigidity, which makes it a pleasure to work with, making it the product of choice used by many of the registered chimney technicians throughout the UK and Ireland. If we are being honest, you are the one paying for the product, and we are normally the ones working with it, so we are all winning. Click here for a full brochure explaining the flexible liner.